Coastal routes have an abiding fascination for the discerning traveller, whether it be the rugged drama of America’s Pacific Coast Highway or the exhiliarating run from Melbourne to Adelaide in Australia, with its rolling panorama of contrasts. By contrast, South Africa’s Garden Route, on the Cape coast, is still something of a hidden gem, although the country’s ever-expanding tourism trade means that it’s less of a secret than it was perhaps a decade ago. The Garden Route stretches from Mossel Bay in the Western Cape to the Storms River which is crossed along the N2 coastal highway over the Paul Sauer Bridge in the extreme eastern reach of the Western Cape. In practice, most of its visitors begin at Cape Town and finish up at either Port Elizabeth or Durban, where they generally either catch a plane home or strike north for the game parks, Kruger being the most popular. Cape Town is a wonderful start for any journey, with its dramatic, big skies and cosmopolitan city centre sheltering under the imposing landmark of Table Mountain. Cape Town’s unpredictable weather - be prepared for alarmingly high winds in any season - means that the mountain is often covered by the “Table Cloth”, a fringe of fluffy white cloud sitting atop its broad top plateau. Cape Town is the place to get all your shopping done and of course to pick up the hire car - you can travel the Garden Route by train, but for ultimate flexibility and the odd inland strike, a car offers the ultimate in flexibility. After leaving Cape Town the Garden Route proper beings in the lovely town of Mossel Bay (pictured), named for its abundant mussel beds by Dutch navigator Paulus van Caerden in 1601. Mossel Bay has the second mildest all-year climate in the world - the first is Hawaii, in case you were wondering. It’s a compact little place, with a modest museum celebrating the bay’s discovery by Portugese explorer Bartholomeu Diaz in 1488 and an aquarium which features a great white shark caught locally. This last is a reminder that inviting as the Cape Coast may look, it is not without its risks. More deadly than the sharks are “rips” which easily match some of the most notorious in Australia for risk factor. Take care and don’t swim outside of designated zones. Mossel Bay’s picturesque qualities are somewhat hampered by the “Mosgas” refinery which has been built adjacent to the town, though the plant has significantly benefited Mossel Bay’s economy. Your next port of call on the Garden Route should undoubtedly be slightly inland - the pretty little town of George, which is also the route’s administrative centre. George nestles on a plateau between sea and mountains and retains many original colonial-style buildings. George is also the starting point for another captivating detour - the Stellenbosch wine route. It’s certainly worth heading into the interior a little to visit some of the region’s excellent vineyards, with the obligatory tasting. George is also the turn for a visit to Oudtshoorn, the largest town in the Little Karoo region. Oudtshoorn’s fame comes from a rather ungainly, aggressive pot-roast. 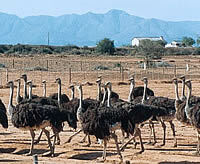 It has the world’s largest ostrich population and thousands of visitors flock there (geddit?) every year to visit some of the specialised breeding farms. The town’s most famous inhabitant not sporting feathers was one CJ Langenhoven, a writer considered to be one of the fathers of the Afrikaans language. By now the Garden Route’s scenic factor is already high, but it simply goes off the scale as we rejoin the coast at Knsyna (pronounced nize-nuh). The town is primarily built on the northern shore of a large warm-water estuary, fed by the Knysna River. This estuary eventually opens to the ocean after passing between two large headlands, known appropriately enough as The Heads. They may look pretty, but The Heads have become infamous due to the loss of boats and fishermen passing through their treacherous and unpredictable waters. 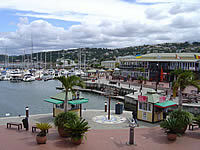 Knysna itself (pictured) is a cosmopolitan little town. It has many excellent restaurants and with its mild climate has become a magnet for people reaching retirement, golfers and hippies, thanks to its thriving arts and crafts scene. If you decided to take the Outeniqua Choo Tjoe steam train along the Garden Route instead of driving, Knysna is also the official end of the line. In practice, due to damage to the line caused by recent flooding, the train currently stops short of Knysna itself too. Another reason to opt for the car this time. Only a few more miles down the route, but worth a stop in its own right, is Plettenburg Bay. 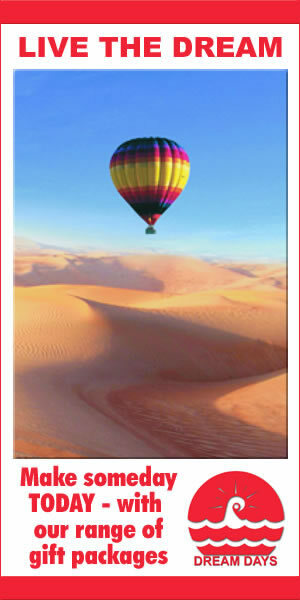 Plet is world famous for its scenic beauty, especially the rolling, white-sand beaches. Whales are often seen off the coast here, as are dolphins cavorting in the surf. Beware - Plet (pictured) is extremely popular with the South Africans themselves and it can get unbearably busy quite easily, especially during the summer season, where its modest infrastructure struggles to cope with the weight of visitors. Nature’s Valley is a resort and retirement village a little further along the route. As its name suggest, it is an absolute haven for wildlife of all descriptions. For a long while, travel along the Garden Route parallel to the coastline was impossible, due to the extremely deep and precipitous river gorges blocking all east-west traffic. Nature’s Valley only became easily accessible after Thomas Bain completed the Grootrivier Pass in 1880. A hundred years later, the demands of road transport would dictate the building of a freeway with enormous concrete bridges - a tribute to the skill of engineers and bringing in its wake considerable collateral damage to the environment. Storms River marks the official end of the Garden Route - a rugged little town popular as a centre for extreme sports, many of them involving water of course. But as I already mentioned, most visitors will at least push on to Port Elizabeth. “PE”, as it’s often called, is also nicknamed “The Friendly City”. It now forms part of the Nelson Mandela Bay Municipality, which has a population of more than one million. PE’s beaches are a magnet for tourists, but the city also has a number of engaging historic attractions, linked by the Donkin Heritage Trail (pictured). Those who push on a little further along the coast to Durban will find a rather different atmosphere. Durban is the second most populous city in South Africa and has that “big city” vibe. Again, the beaches are a huge draw, especially for surfers. The Golden Mile, with its casinos and conference centres, is a match for any similar facility anywhere in the world. The Garden Route is a route of contrasts, its memories a series of breathtaking snapshots to treasure for ever. Go and discover it for yourself soon.